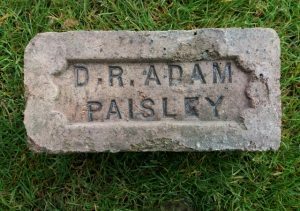 D R Adam Paisley – Daniel Rankine Adam – He and Robert Adam had a partnership and had brickworks at Belvidere, Glasgow and Love Street, Paisley and Inkerman, Paisley and Pollok (ck) Corkerhill, Glasgow and Nitshill, Glasgow and Rutherglen, Glasgow. Found by Michael Fallone in Glasgow. 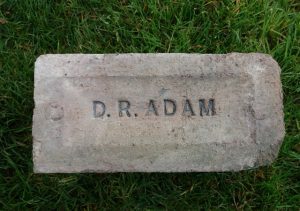 D R Adam Paisley – Daniel Rankine Adam – He and Robert Adam had a partnership and had brickworks at Belvidere, Glasgow and Love Street, Paisley and Inkerman, Paisley and Pollok (ck) Corkerhill, Glasgow and Nitshill, Glasgow and Rutherglen, Glasgow. 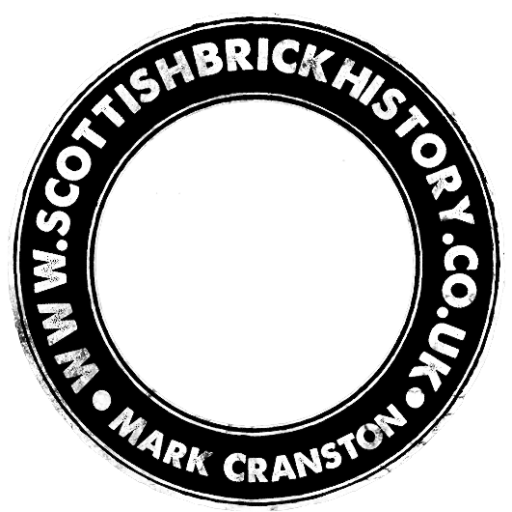 Note the serifs. 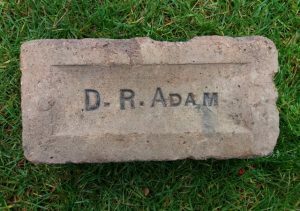 This is a circle brick. 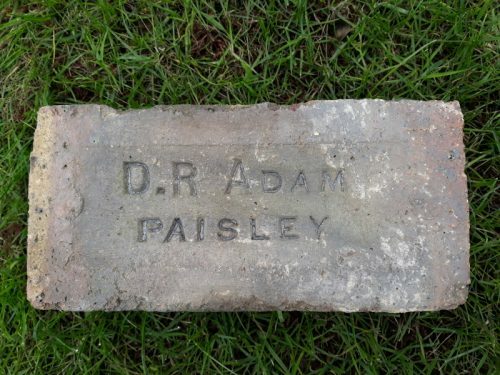 . .
Found Paisley D R Adam Paisley – Daniel Rankine Adam – He and Robert Adam had a partnership and had brickworks at Belvidere, Glasgow and Love Street, Paisley and Inkerman, Paisley and Pollok (ck) Corkerhill, Glasgow and Nitshill, Glasgow and Rutherglen, Glasgow. 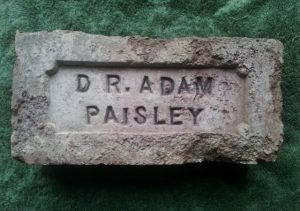 . . . .
Found in Paisley by Stevie Pattison. 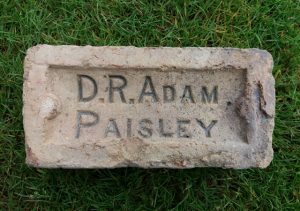 D R Adam Paisley – Daniel Rankine Adam – He and Robert Adam had a partnership and had brickworks at Belvidere, Glasgow and Love Street, Paisley and Inkerman, Paisley and Pollok (ck) Corkerhill, Glasgow and Nitshill, Glasgow and Rutherglen, Glasgow. . . .
Found Paisley. 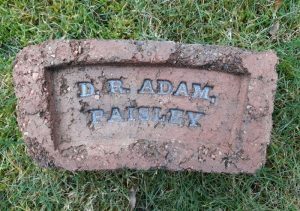 D R Adam Paisley – Daniel Rankine Adam – He and Robert Adam had a partnership and had brickworks at Belvidere, Glasgow and Love Street, Paisley and Inkerman, Paisley and Pollok (ck) Corkerhill, Glasgow and Nitshill, Glasgow and Rutherglen, Glasgow. . . .